Video: Miracle - Conception to Birth Visualized - Any questions? 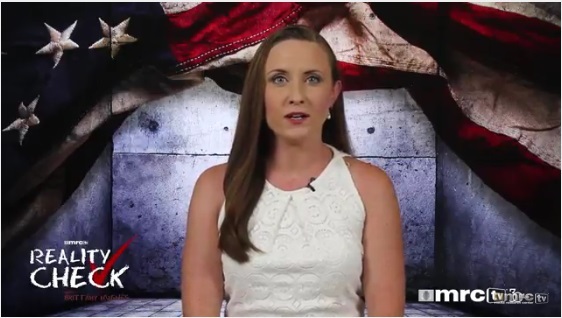 Video: Oh, the horror ... "Pregnancy Tissue"
Abortion isn’t About Choice. It’s About Selfishness. You Cannot Change The Minds of Evil People. Evil People Must Be Defeated. Surgery on mom who's unborn baby was growing outside the womb. Graphic 8 second Video shows the baby moving, but sadly, it did not survive. 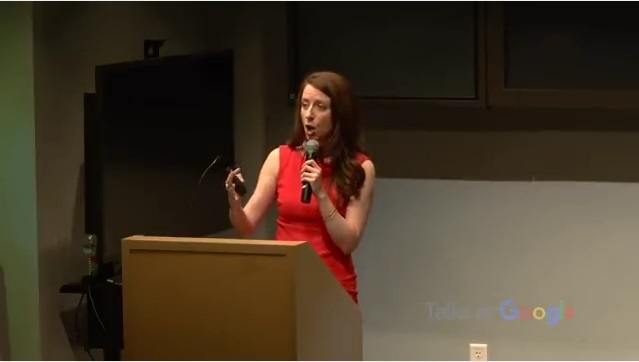 The most moving testimony you'll hear about the reality of abortion and the LIE of Planned Parenthood. 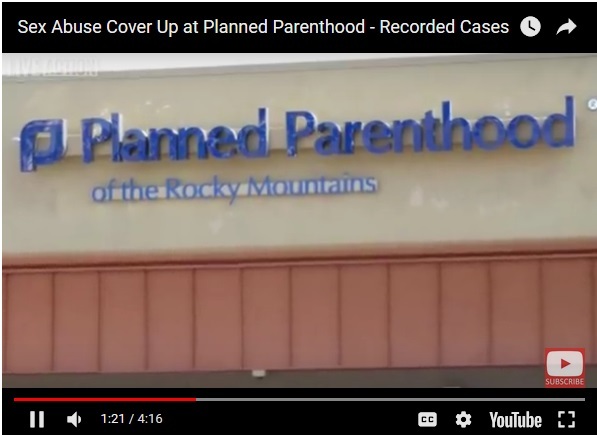 Dr. Michael Brown talks to a woman who has come to the realization that working in an abortion clinic is torturing her soul and in the process, reveals the extremes of emotion for the women and workers. 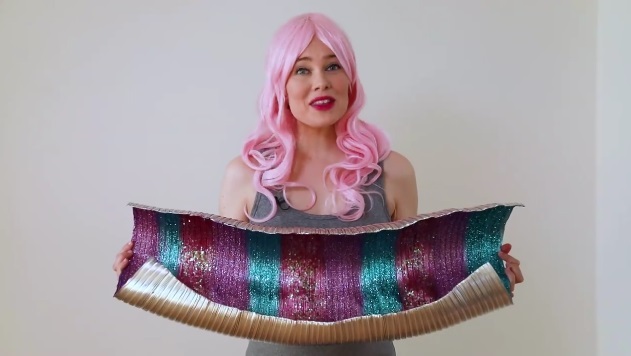 The Magical Birth Canal - What is it's secret? January 27, 2017 March for Life, Washnigton. 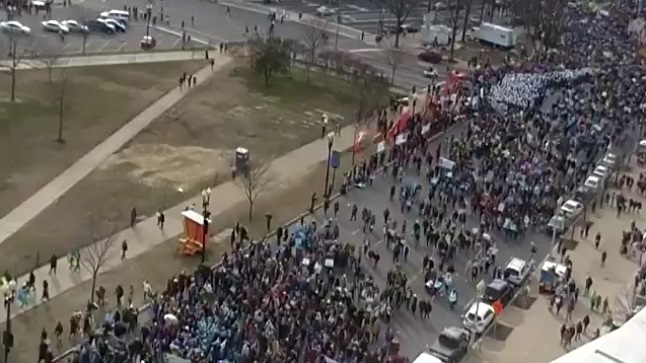 D.C., hundreds of thousands! Video (graphic) - Clump of cells? How about twins, and the mother was never told. The killing of Harambe at the Cincinnati Zoo highlights the need to adopt stronger legal protections for the rights of animals. Other countries, especially in Europe, have begun to provide legal rights and protected status to primates as living beings. Non-human primates should have the legal right to live freely or, when necessary, in sanctuaries only for medical rehabilitation or ecological assistance for endangered species. Harambe was killed by a zoo which raises revenues by selling tickets to see captive animals, including primates. While good emergency staff training might have prevented such a catastrophic outcome, the Green Party believes that captivity for such entertainment is ethically wrong and fundamentally exploitive and should be illegal. Hey Jill, why not this? The killing of unborn babies at the Cincinnati Planned Parenthood highlights the need to adopt stronger legal protections for the rights of humans. Other countries, especially in Central America and Africa, have begun to provide legal rights and protected status to the unborn, as living beings. Humans should have the legal right to be born or, when necessary, to be in incubators only for medical rehabilitation or ethical assistance for endangered species. 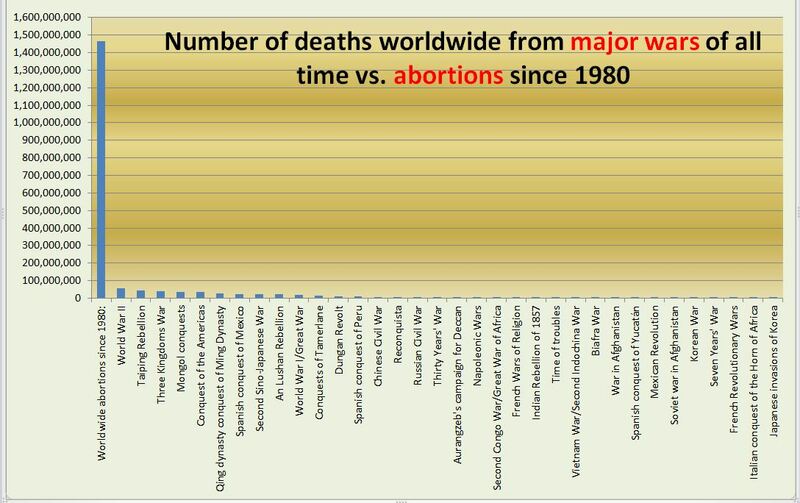 Babies are killed by abortion clinics which raise revenues by selling aborted baby parts, including intact bodies. Good emergency staff training and pro-life counseling might prevent such a catastrophic outcome. Any political Party should believe that such slaughter is ethically wrong and fundamentally exploitive and should be illegal. 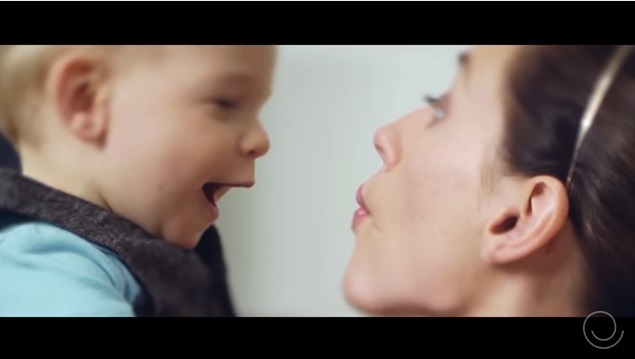 Pro-abortion video about how hard it is to get an abortion and meant to be funny, backfires on NARAL. Shows callousness, depression and total lack of compassion instead. Comments and related videos at end probably not what they intended! Why Are The Leftists Thrilled By Abortion? Heartbeat Bill to get new life in Missouri? City blocks CPC's ultrasound use – why? Planned Parenthood Dumped $730K Into Ossoff's Campaign. Oops. The State did not let them know who their parents were and that they had died and the State adopted them out. What happens to the baby when an abortion fails? Study: 1st beat of preborn's heart after just 16 days? A blob, a cancer? Or a miracle gift from God born prematurely at just 25 weeks? An abortion after 24 weeks is still legal in several states. 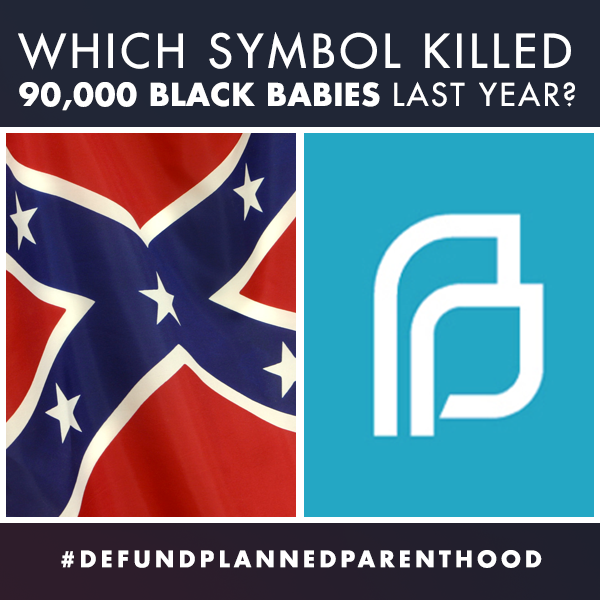 Which symbol Killed 90,000 Black Babies Last Year? "That special power of loving that belongs to a woman is seen most clearly when she becomes a mother. Motherhood is the gift of God to women. How grateful we must be to God for this wonderful gift that brings such joy to the whole world, women and men alike! Yet we can destroy this gift of motherhood, especially by the evil of abortion, but also by thinking that other things like jobs or positions are more important than loving, than giving oneself to others. No job, no plans, no possessions, no idea of "freedom" can take the place of love. So anything that destroys God's gift of motherhood destroys His most precious gift to women-- the ability to love as a woman." "We must not be surprised when we hear of murders, of killings, of wars, of hatred. If a mother can kill her own child, what is left but for us to kill each other." "Once that living love is destroyed by contraception, abortion follows very easily." "Abortion kills twice. 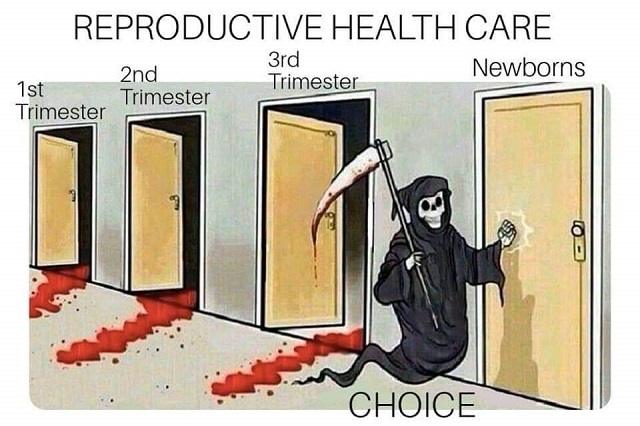 It kills the body of the baby and it kills the conscience of the mother. Abortion is profoundly anti-women. Three quarters of its victims are women: Half the babies and all the mothers." "America needs no words from me to see how your decision in Roe v. Wade has deformed a great nation. The so-called right to abortion has pitted mothers against their children and women against men. It has shown violence and discord at the heart of the most intimate human relationships. It has aggravated the derogation of the father’s role in an increasingly fatherless society. It has portrayed the greatest of gifts ~ a child ~ as a competitor, an intrusion, and an inconvenience. It has nominally accorded mothers unfettered dominion over the independent lives of their physically dependent sons and daughters. And in granting this unconscionable power, it has exposed many women to unjust and selfish demands from their husbands or other sexual partners. Human rights are not a privilege conferred by government. They are every human being’s entitlement by virtue of his humanity. The right to life does not depend, and must not be declared to be contingent, on the pleasure of anyone else, not even a parent or a sovereign." 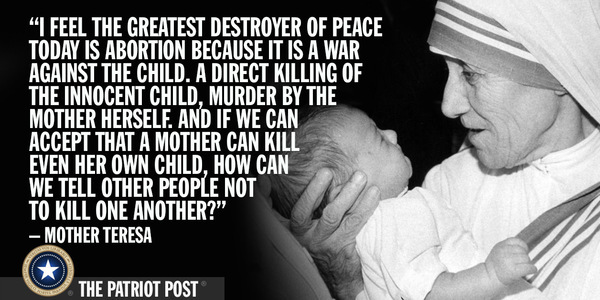 The greatest destroyer of love and peace is abortion, which is war against the child. The mother doesn't learn to love, but kills to solve her own problems. Any country that accepts abortion is not teaching its people to love, but to use any violence to get what they want." "The way to plan the family is natural family planning, not contraception...This (use of contraceptives) turns the attention to self and so it destroys the gift of love in him or her. In loving, the husband and wife must turn the attention to each other as happens in natural family planning, and not to self, as happens in contraception. Once that living love is destroyed by contraception, abortion follows easily . . . And abortion, which often follows from contraception, brings a people to be spiritually poor, and that is the worst poverty and the most difficult to overcome." Any country that accepts abortion is not teaching its people to love, but to use violence to get what they want. That is why the greatest destroyer of love and peace is abortion"
"Many people are concerned with children of India, with the children of Africa where quite a few die of hunger, and so on. Many people are also concerned about the violence in this great country of the United States. These concerns are very good. But often these same people are not concerned with the millions being killed by the deliberate decision of their own mothers. And this is the greatest destroyer of peace today- abortion which brings people to such blindness." " We must remember that life begins at home and we must also remember that the future of humanity passes through the family"
"It is a poverty to decide that a child must die so that you live as you wish"
"Be humble like Mary so that you can be holy like Jesus"
I feel that the greatest destroyer of peace today is abortion, because it is a war against the child, a direct killing of the innocent child, murder by the mother herself." "By abortion the Mother does not learn to love, but kills her own child to solve her problems. And, by abortion, that father is told that he does not have to take any responsibilty at all for the child he has brought into the world. The father is likely to put other women to the same trouble. 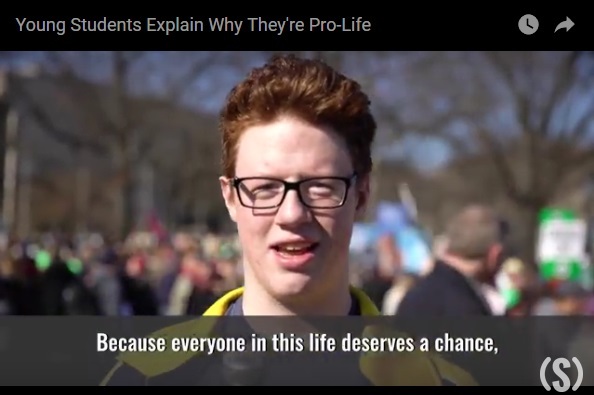 So abortion leads to more abortion."